I am an officer with CBP down at San Ysidro guarding the border and have really wacky hours. I have the drive for workouts and love working out, but my schedule doesn't always promise a lift everyday. I want to make sure my officer presence and size remains high, so I can take care of myself in a very hostile environment. Do you have any advice/routines/diet plans for me to build mass? I'm 6', 210 and fairly solid, but I feel to have plateaued. I was attracted to your article about LEOs and workouts and got your email from there. Thank you for your time looking forward to hearing from you. My Answer: I actually wrote a book specifically about how to train for an unpredictable schedule like that of law enforcement. It's called Strength and Physique: Training for the Busy Bodybuilder. 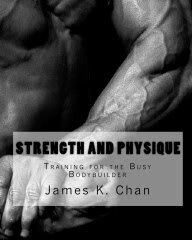 In this book I show you the least you can do to achieve mass and muscularity while still living a life outside the gym. It's meant for the modern day Renaissance Man who wants a phenomenal physique, but also wants to live life and pursue other interests. This book is about maximum muscle through minimum effort. This idea came about simply because my life has gotten busier and busier over the years. Most of us have to juggle work, family and hobbies, and yet most magazines and books will provide you training programs where you have to commit to the gym often and at regular frequencies. Many of these programs are either based on a periodization strategy and/or high frequency split training. The problem with periodization programs is that you must commit to regular workouts. Each workout builds on the other; so missing a workout will compromise your strength and mass development. If you use a 3-4 way split routine that bodybuilders typically use, then missing a workout means missing needed work on a muscle lagging in size. Strength and Physique: Training for the Busy Bodybuilder shows you how to train specifically and more effectively for a busy and unpredictable schedule. Make no mistake: for size and strength, a high frequency training program is superior to a low frequency training program. But if you cannot commit to 3-4 workouts evenly spaced throughout the week, then you have to train differently to make the best of a bad situation. This book will show you how to train on a low frequency program, so that way you can enjoy life outside the gym.